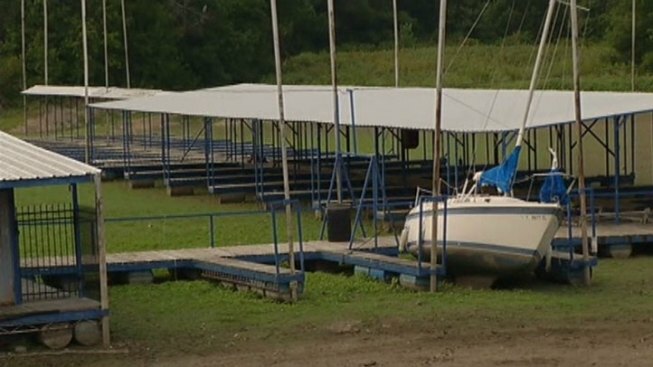 Texas lake levels will reach an historic low within the next two weeks, according to a report from a Texas A&M climatologist. "If they keep going down at the present rate, it will only take about two more weeks before they will set an all-time record for the difference between how much water they were designed to hold and how much they water they actually have in them," Dr. John Nielsen-Gammon told the publication Texas A&M AgriLife Today. "We continue to set record levels for this time of year, but this will be an all-time record low." In a phone interview Thursday, Dr. Nielsen-Gammon told NBC 5 the impact from the ongoing drought can be seen in water restrictions that have been instituted in many communities across Texas, and the subsequent shrinking water allotments for farmers, who are losing crop land and which is, in turn, leading to increased food prices at the supermarket. Benbrook Lake is one of several lakes managed by the Tarrant Regional Water District that has seen its level drop dramatically in the last few months. The lake is approximately eight feet below where it should be, and is dropping an estimated one inch farther every day, according to daily reports issued by the TRWD. "Well, the water is very low right now," said Benbrook resident Dwight Backus, who spent Thursday hiking along the rocky, receded shoreline of Benbrook Lake. "At the beginning of the spring it's usually all the way up to the boat ramp there," Backus said while pointing to a ramp that ends roughly 25 feet short of the water. Overall, the 25 lakes maintained by the Fort Worth District of the Army Corps of Engineers are at approximately 60 percent capacity. And according to one of the Corps' managers, there is no magic bullet to correct the problem. "We see this trend continuing for at least the short term," said Jerry Cotter, Chief of Water Resources. "And we're gonna [continue to] see the high demands that we have, plus the evaporation that we're seeing out of the reservoirs; we're gonna see them continue to drop." Cotter said there is no need to be concerned that drinking water supplies will begin to disappear any time in the foreseeable future, but he does encourage North Texans to conserve water to prevent the problem from getting worse.